Since the Tacos were not too hot the last time I was at Lola’s Mexican Kitchen (click here to see the last post), I decided to return and try something else. Unfortunately, Lola’s did not make my heart sing. Again. Brisket Burrito: sweet plantains, queso fresco, peppers, onions, refried beans, ancho bbq sauce. I just realized what a dumb mistake I made. I essentially ordered the same food as the last time, just wrapped in a different packaging. Last time, it was wrapped in a taco and this time in a burrito. Guess what? My experience and comments are the same. Too much sauce and the brisket is dry. The rice and beans was decent. Slow Braised Short Rib: tequila-beer marinade, peppers, onions, smoked chipotle sauce, fried plantains. The moral of the story here is that when going to Lola’s Mexican Kitchen, stick to house specialties on the menu. The meat was tender and fell off easily when cut in and in the mouth. The marinade and the smoked sauce worked well together. This was a tasty dish. Qui lait cru !?! Fromagerie is a fromagerie that we frequent when we are in Montreal. 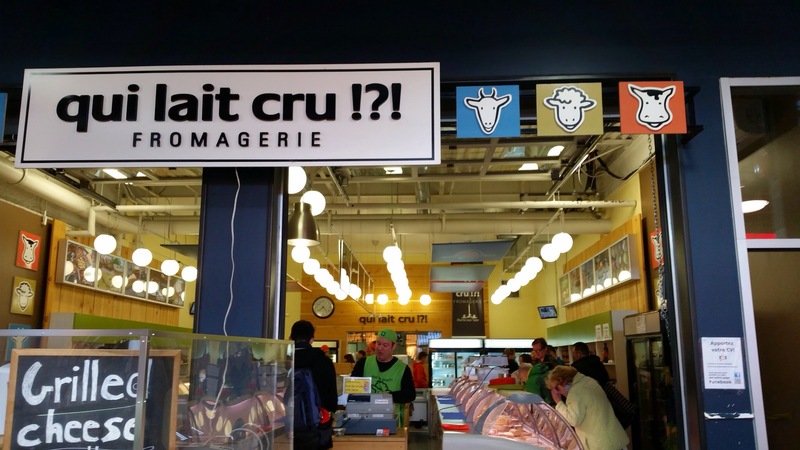 It is located inside the Jean-Taon Market place. 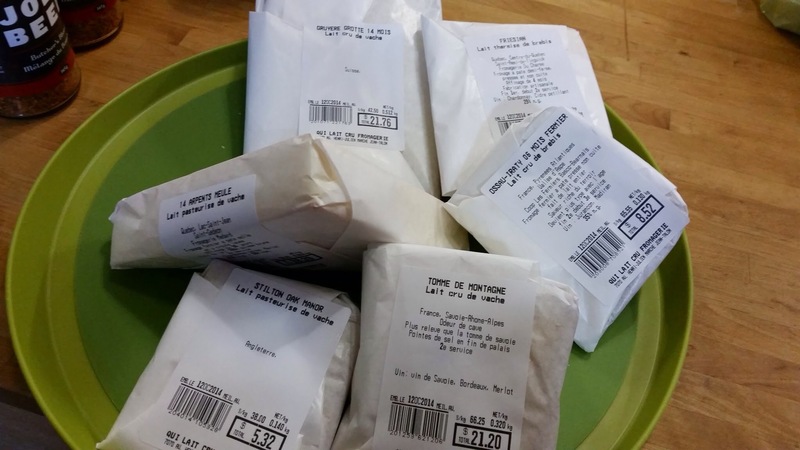 It’s an artisanal cheese shop that sells cheese from goat, sheep and cow. One can sample any one of their cheese before purchase. 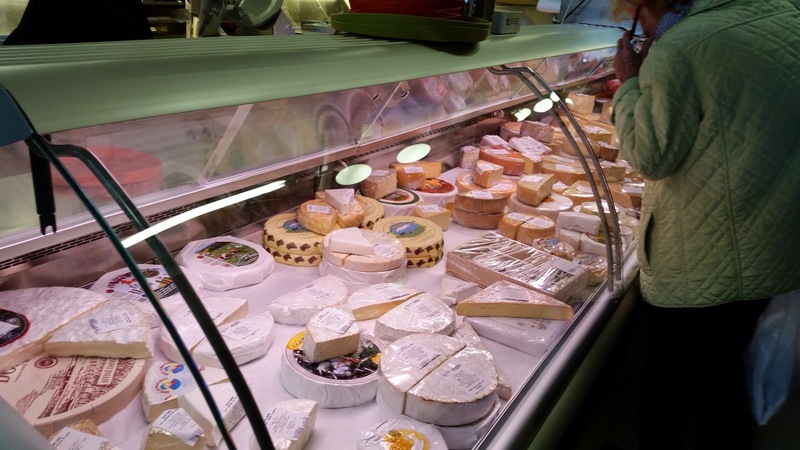 They carry an incredible number of cheese from the Quebec region and around the world (mostly French and Spanish). Look at their signs – how cute! 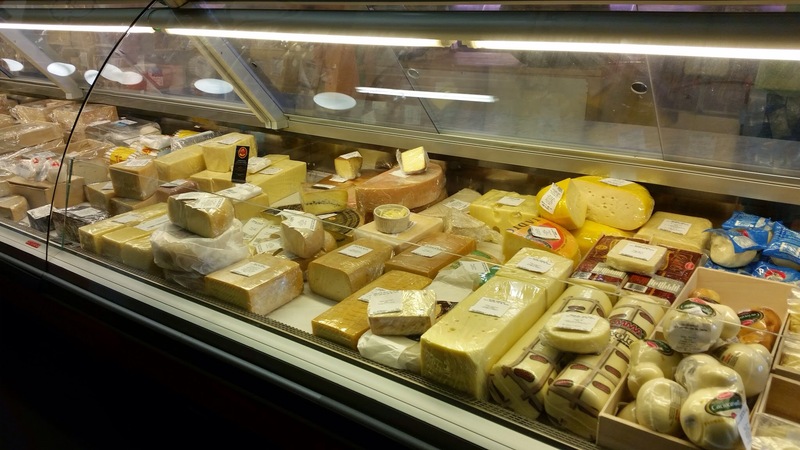 Do you have a preference for type of cheese you like? Cow’s milk? Sheep’s milk? Or goat’s milk? Personally, I am diverse but prefers a semi-soft cheese from cows with a nice crust that is not too stinky. There is usually a long line to the store and you go around their u-shaped cheese cases, trying whatever cheese you desire. One particular cheese I had this time had a crust that is washed by Chardonnay, Merlot and sea salt. Mmm. Interestingly when we asked the cheese monger, a young man in his 20’s hailing from Northern Quebec where only cows roam (his words, not mine), to recommend something to us. He asked us where we are from and quickly went to raw milk cheese or “illegal” cheese in New York. 🙂 The recommended cheese was excellent. I wish we would loosen up our regulations to let in more delicious cheese. Here is our loot, a combination of hard and semi-soft cheese with half kilo of Gruyere from Switzerland. It was a very happy day indeed. 🙂 Highly recommend. It’s worth the 6-hour trip from New York. 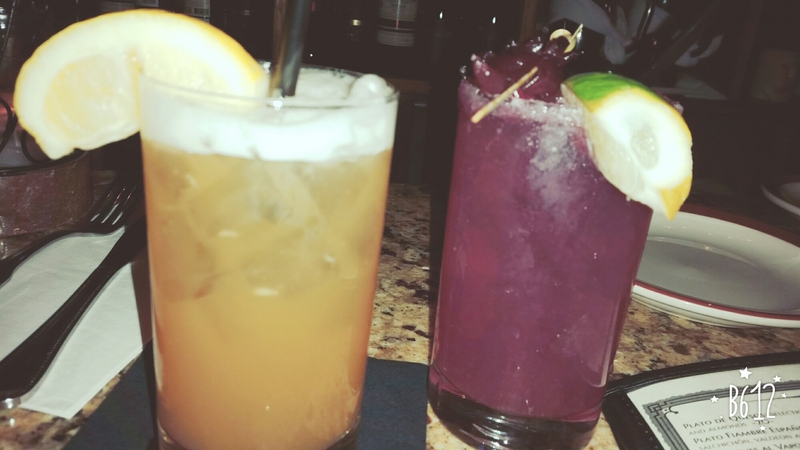 Casa Mono in Manhattan, NY – Tapas, Tapas, Tapas! 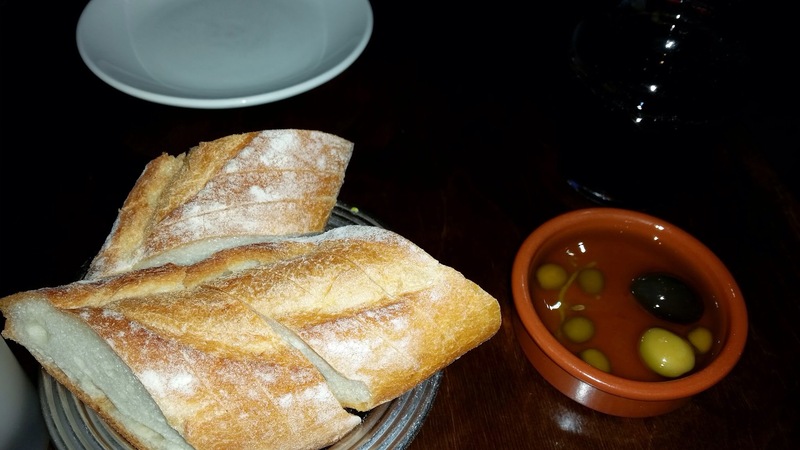 Here is the nice baguette with excellent olive oil and olives. I was very hungry when I arrived and found the bread & olives combination pretty awesome. Could be somewhat biased due to hunger. 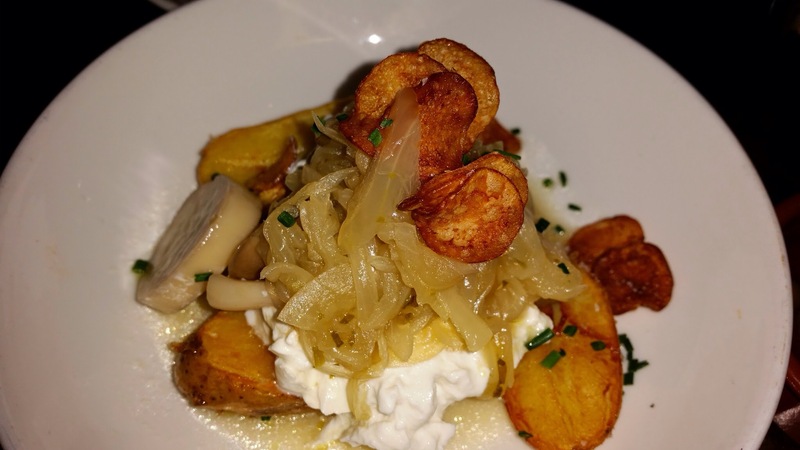 Buffalo’s Milk Burrata with Amontillado Onion Broth and Crispy Potatoes: The Burrata was more runny than what I like but the broth was good. 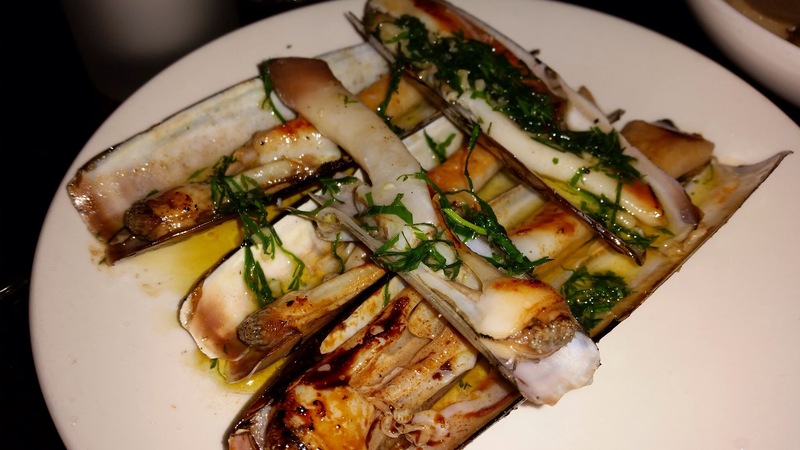 Razor Clams a la Plancha: This dish kills. 🙂 Best of the night. Hands down. 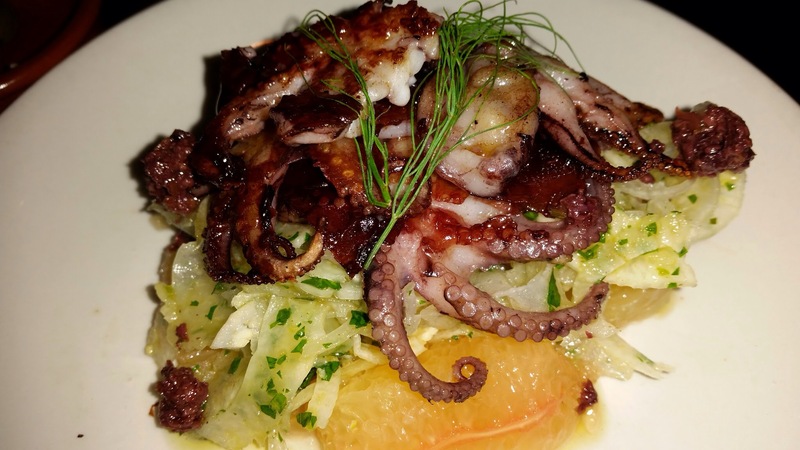 Pulpo with Fennel and Grapefruit: This was ok. I like Octopus so it’s hard for Octopus to be wrong for me. Should be grilled instead of fried. Should probably use a slightly larger cut. 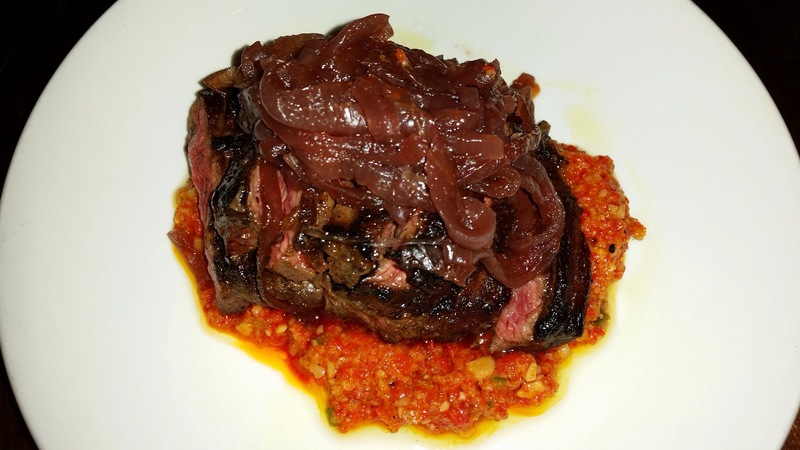 Skirt Steak with Romesco and Onion Mermelada: second best dish of the night. Fulfilling, succulent, tender and juicy. All the right things for skirt steaks. If it were not $17 for a small plate, I would have had 2-3 of them. The Romesco was excellent, a bit spicy. Just perfect! 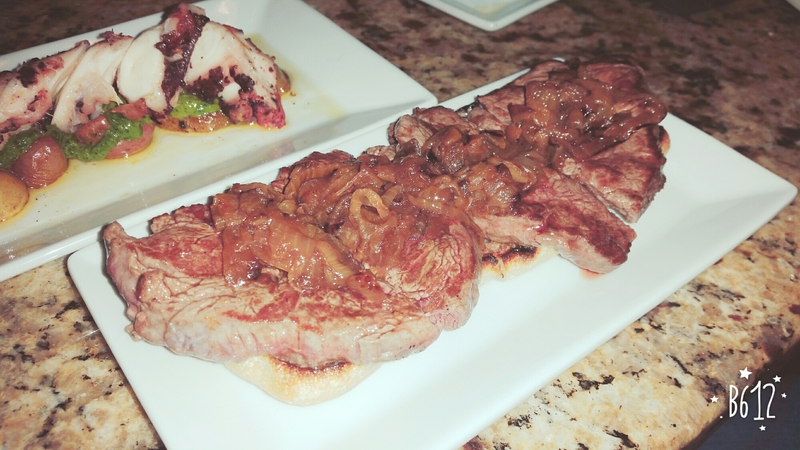 Crispy Pig’s Ears and Squid, Watermelon, Apple Cider Gastrique, Goat Cheese: This is a close third to the skirt steak. 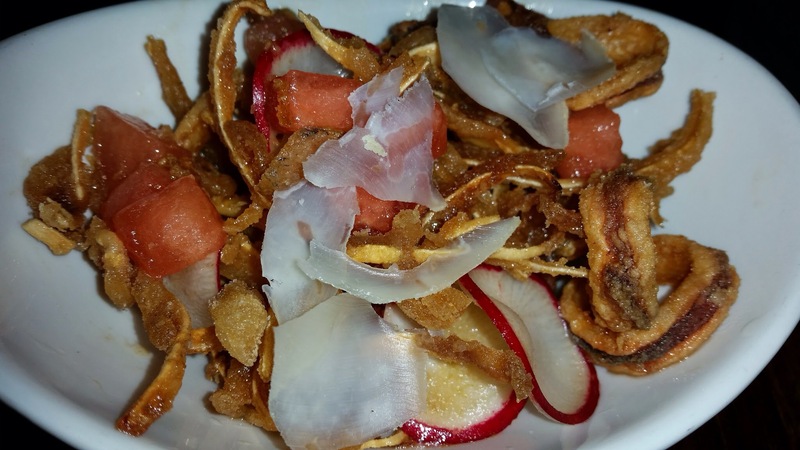 The pig’s ear is really crispy and I just love the crunchiness of it. Munch. Munch. The calamari was not as good, too salty. 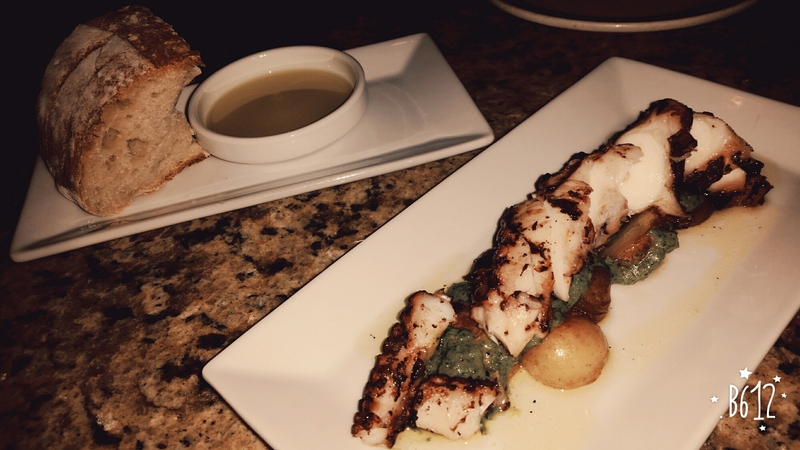 The dish did not really need the squid in my opinion. This was a great dinner. The restaurant was at a corner and was completely open to the sidewalks on two sides. My friend and I looked out to NYC getting dark and people watched. We also enjoyed a wonderful Rioja. It was tart and oaky. We had the CVNE Viña Real Reserva 2009 Rioja from Tempranillo, Mazuelo, Graciano, Garnacha. Casa Mono had a long and interesting wine list. I loved it. Definitely recommend both the food and the wine. Only one down side: tapa plates are small so don’t go in hungry. I ended up wanting to swing by a Korean joint to get some rice cake soup to supplement. 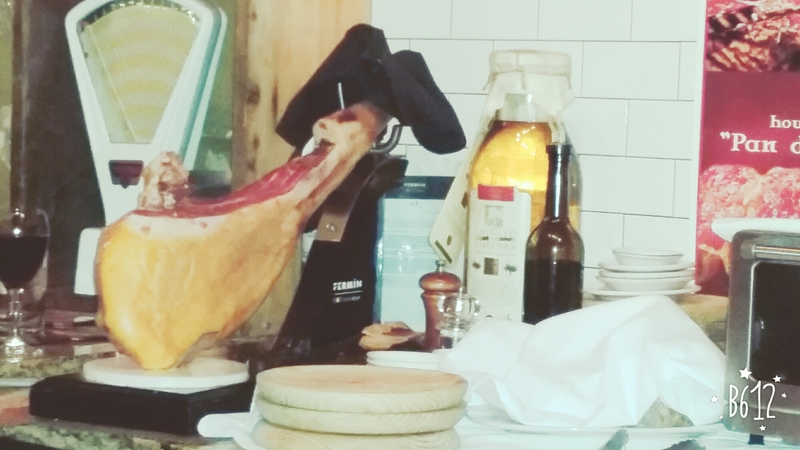 Posted on October 5, 2014 October 4, 2014 Categories Cuisines, Manhattan, New York Metro, NYC, SpanishTags casa mono, NYC restaurant, spanish food, spanish restaurant, tapas1 Comment on Casa Mono in Manhattan, NY – Tapas, Tapas, Tapas!